There is a magnificent ring of twelve bells in our church tower - the only church in Kent, other than Canterbury Cathedral itself, with this number of bells; a number usually found in cathedrals and great city churches, and very rare indeed in a country parish. The art of English change ringing is our special and unique national music, just as the bagpipes are for Scotland, or the male voice choir of Wales. 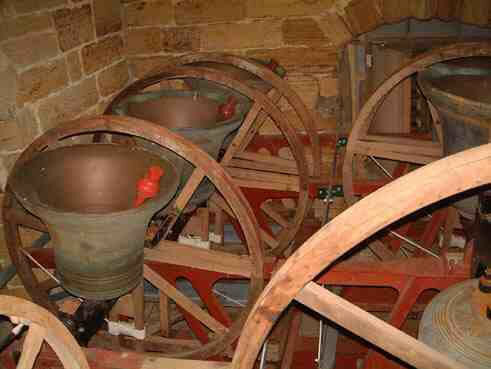 Our local band is struggling to survive - we now commonly ring four or five bells only on Sundays - out of a ring of twelve! The bells are well used as a centre of advanced training and performance for proficient ringers from all over Kent and Sussex, on the first and third Fridays of each month - but this does not help us for local Sunday service ringing or weddings. Ringing is a craft for all ages .... and beliefs! 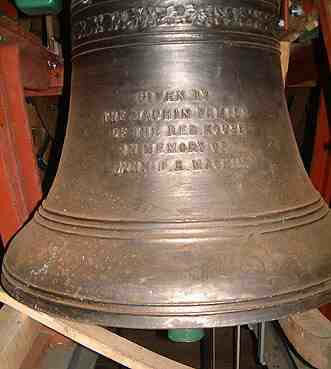 Ringing is a musical craft practised by anyone aged 8 to 80, men and women in roughly equal number . It does not require great strength - about the same amount of physical effort as walking. It does require an initial commitment, as does any other musical instrument, to learn to handle a bell safely with the necessary skill - a small number of sessions of individual tuition. It remains a fascinating and, to many, fairly addictive skill, to learn the art - perhaps midway between music and dancing - to strike and weave one's bell through the complex musical patterns of change ringing. Ringers are a strong freemasonry; once you can handle a bell, you are always welcome in any of the 6000+ ringing towers of the UK, Ireland, US, Aus./NZ - and like all shared skills and pastimes, there is a strong social bond; few better ways of gently raising an honest thirst! No religious affiliation or belief is required - indeed ringing for church services was actually banned as "popish" for the first few centuries of the art, and only became normal after about 1850. Also, it is about the least expensive pastime there is - both equipment, and training, are free! There are perhaps not all that many such pastimes, enjoyed by parents and children together on equal terms, as ringing is. We are always most happy to give anyone a tour of the tower and a try at handling a bell. Ring me on 240083, email rodericklebon@hotmail.com - or just come up the tower on a Sunday morning or Wednesday evening if you hear us ringing. If it isn't for you, perhaps you know someone it might be for? It would be a huge tragedy if our wonderful bells were to fall silent on Sundays - and that is where they are now rapidly heading, if nothing is done. Please think whether you, or someone you know, could join the band and prevent this.